The first issue of Marvel Comic’s rendition of Austen’s Emma is on the stands at your local comic book shop! As in the previous Marvel editions, Pride and Prejudice and Sense and Sensibility, Nancy Butler writes the text, but there are newcomers to the artwork: Janet K. Lee illustrates, and Nate Piekos pens the script. My only complaint is it seems to lack depth – it is perhaps a little “too light bright and sparkling” – Emma and Harriet look too much alike to differentiate without reading the dialogue, and everyone but Knightley is blond or white-haired, and Emma seems to scowl in sort of a snobbish condescending way, though many would agree that is the way she should look! [and I do love Emma’s scarlet pelisse!] But Ms. Butler does gets the dialogue just right. [Emma] You have forgotten one matter of joy to me – that I made the match myself. And I accomplished it when everyone said Mr. Weston would never marry again. But I determined that he should four years ago when we met him in the rain and Miss Taylor borrowed his umbrella. — When such success has blessed me, I cannot think I will leave off match-making. Success? [says Mr. Knightley] – A straightforward man like Mr. Weston and a rational woman like Miss Taylor can surely be left to manage their own concerns. Where is your merit in this, Emma? Will see if this series grows on me as the others have done … Issue 2 will be released April 6, 2011. 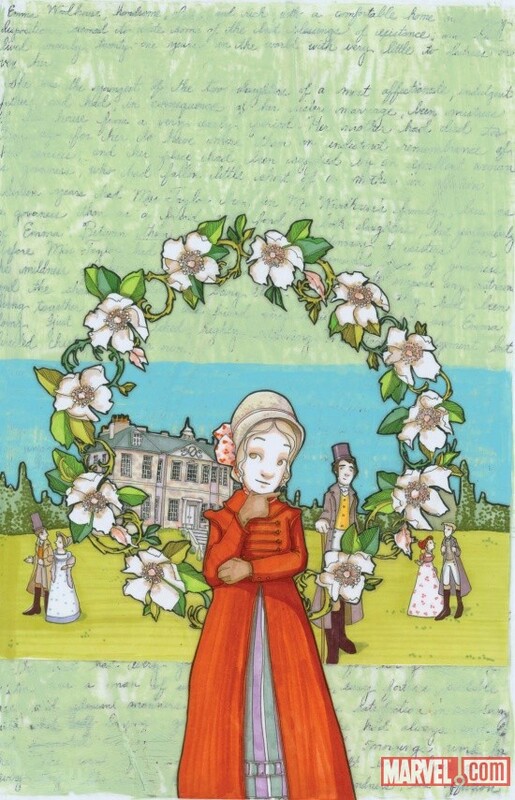 All five issues and the hardcover: certainly another edition of Emma you must add to your Austen Library! Copyright @2011, by Deb Barnum at Jane Austen in Vermont. 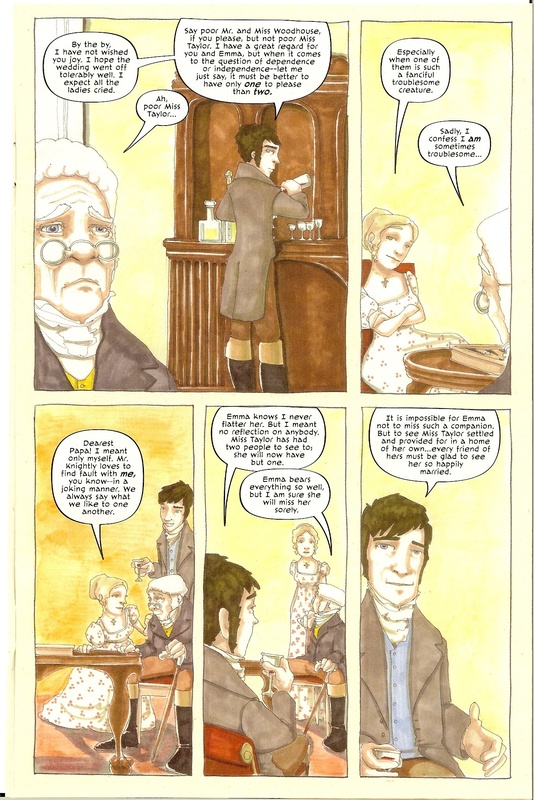 This entry was posted in Books, Jane Austen, Jane Austen Popular Culture, News, Your Austen Library and tagged Emma, Jane Austen, Janet K. Lee, Marvel Comics, Nancy Butler. Bookmark the permalink. ← Hot off the Press! ~ ‘Jane Austen’s Regency World Magazine’ ~ 50th Issue!